SAN JOSE, Calif. – January 30, 2018 – Angie Hospitality, developer of the world’s first enterprise-class, cloud-managed interactive guest room assistant, purpose-built for the hotel environment, is announcing its sponsorship of HT-NEXT 2018, taking place in San Diego from March 12-14 at the Manchester Grand Hyatt. One of the fastest growing industry events, the three-day conference combines Hospitality Technology’s Hotel Technology Forum and HTNG’s North American Conference to offer hospitality industry professionals and key decision makers a complete view of the evolving technologies expected to make waves in the industry. As an event that attracts hospitality industry leaders from around the world, HT-NEXT hosts numerous networking events and educational opportunities focused on the latest technological advancements and offerings. Topics covered during several scheduled sessions include innovating the guest experience, the rise of AI and the intelligent hotel. Leading the industry in voice-activated and guest room assistant technology, Angie Hospitality is set to provide attendees with insight on how hotels can address the ever-increasing consumer expectations for personalized service and enhanced convenience through the use of AI driven, voice-based solutions. Serving as a 24-hour guest room assistant purpose-built for hotels and resorts, Angie was developed with not only interactive guest service in mind, but back-of-house operational efficiency. Key features include its ability to provide guests with secure, customizable in-room Wi-Fi connectivity, voice-based room controls, telephony, and access to an array of hotel services and amenities. 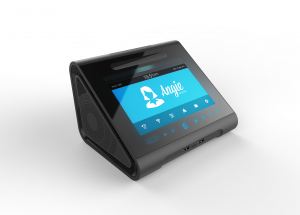 Leveraging future-proof technologies, including Zigbee and BLE, and equipped with both voice and touchscreen interactivity, Angie provides hoteliers with an all-encompassing in-room solution that immediately responds to guest and staff requests with a simple voice command. Angie is currently being implemented at multiple hotel properties in the U.S. and internationally. For more information on Angie’s full suite of capabilities and options, please visit www.angie.ai.